TRACKMAN is your new personal laboratory assistant. Designed specifically to keep you on track as you pipette from one microplate to another. TRACKMAN simplifies your work, improves your productivity and helps avoid pipetting errors and cross-contamination. Free yourself from tedious pipetting jobs and free your results from inconsistencies due to pipetting errors. A Technology You Can Trust... PIPETMAN Built Inside! With PIPETMAN built inside PIPETMAX, you can trust your pipetting to be reliable and consistent, plate to plate, lot to lot, time after time. Configure and customize your run using any reagent and any protocol you want. The hardware and software are built to be customizable. Download pre-developed, validated protocols with simple configurations. Fits under a hood or at your benchtop for maximum convenience. Weighs just under 40 pounds, so moving it is quick and easy too! Hardware can be customized to fit your needs and the pipetting heads can be calibrated just like a PIPETMAN! 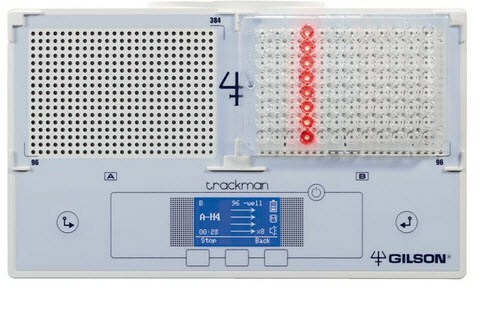 There are no threads in Gilson TRACKMAN Reviews at this time.